You can use WhatsApp to send promotions, order updates and shipping notifications to your customers. It is convenient to use WhatsApp, as you can share images and promo links with your customers via mobile. 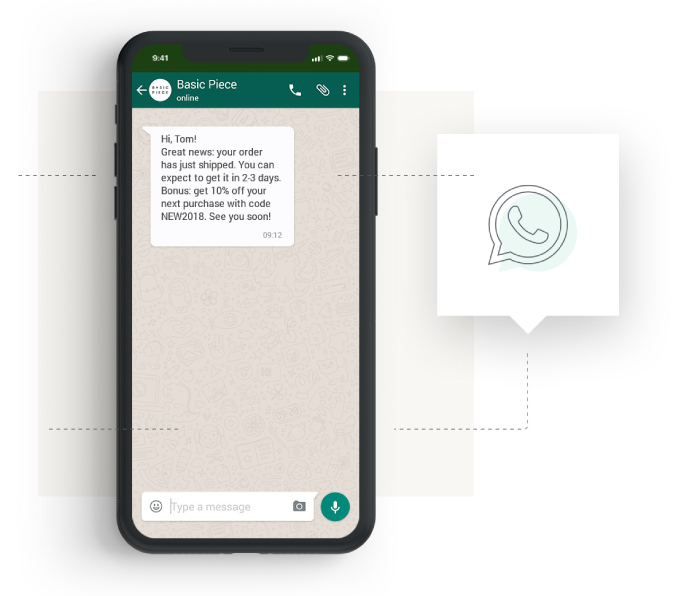 Connect WhatsApp with Omnisend and start sending automated messages to boost your sales. And note, cost per message will solely depend on the country. WhatsApp integrations are currently available upon request. Provide answers and click Submit request to proceed further. Our Team will contact you and will provide information about the next approval steps! When your request is approved, you will need to create a template message (pre-approved by WhatsApp team) and upload it into your Facebook business account. Only approved templates would be active automated messages, however if the customer replies to your automated message, you will have a 24 hour window to send “free form” messages. Just keep in mind, WhatsApp team will be monitoring the number of free messages you send to avoid spam complaints. Give your customers a choice to use a channel that they feel comfortable with for order and shipping updates, and enjoy higher open and click through rates. With Omnisend you can connect channels that your customers use most and get more sales instantly. Omnisend customers who use omnichannel marketing enjoy 90% higher customer retention rate. So if you have WhatsApp as an additional channel in your store, there is a higher chance of reaching your customers wherever they are.